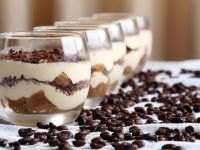 Today we would like to talk about Tiramisu, one of the most famous and appreciated Italian dessert, and we are going to show you a fast and simple recipe to prepare it. Tiramisu originated in northern Italy during the 17th century. There are several legends linked to this dessert. One tells that some pastry chefs in the city of Siena wanted to invent a new dessert in honor of Cosimo de Medici, the Great Duke of Tuscany, to celebrate his greatness. According to the pastry chefs the dessert had to reflect the Duke's personality. It had to be something really special and tasty, since Cosimo was really gourmand, but also needed to be prepared using simple ingredients. At the time Tiramisu was indeed called “the duke's soup”. The recipe was a real success. It was first brought to Florence and then spread all over Italy. Today the Tiramisu is one of the most known dessert in the Italian culinary tradition. Let's discover how to prepare our Tiramisu and make an easy recipe that is worthy of a Great Duke! First of all, separate the egg whites from the yolks. Add half of the sugar to the yolks and use an electric beater until they become frothy and pale. Add the Mascarpone cheese and mix. Now start whipping up the egg whites. When they are almost stiff and dry add the remaining sugar little by little while keeping beating the eggs. When they are perfectly stiff and dry add them to the yolks and mascarpone. Mix gently using a wooden spoon being careful to mix from the bottom upwards. Your cream is now ready! Rapidly dip the Savoiardi biscuits in the coffee and place them on a baking pan or inside a glass if you single portions. Add the cream and then go on with a second layer of soaked Savoiardi and cream. Top your Tiramisu with cocoa powder and chocolate chips. Put the tiramisu in the fridge for 2 hours before serving.